I didn’t leave the house again. There was rain, I had to do tax spreadsheets (it’s all glamour, here…) and my rosacea is so bad, I can’t bear to see anyone. I’ll go out tomorrow, but sometimes I like to be a weird hermit. The best thing that happened today was that I finally caught up with the first episode of Grayson Perry’s new TV series Who Are You? 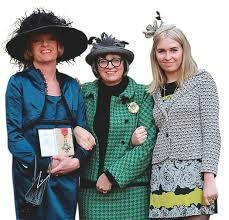 The man who went to collect his CBE from Buckingham Palace dressed as his transvestite persona Claire (above), is fast becoming Britain’s Living National Treasure. I’ve been in love with his brain ever since he did the Reith Lectures last year. His description of the process of gentifrication made me jump up and down clapping in my kitchen. You can download them as podcasts from the BBC website. He topped that triumph with his TV series Taste, which analysed the British class system and how each caste expresses its values through the things they surround themselves with. It’s nothing short of a masterpiece. The new show Who Are You? is a study of identity – fascinating from a man who has two himself, Grayson and Claire. He talked to a very wide variety of people about how they define themselves and then made a portrait of them. 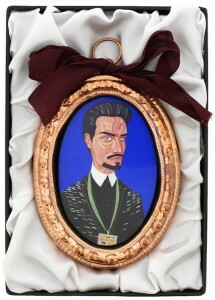 He rendered reality TV star Rylan Clark (from X Factor contestant, to winning Celebrity Big Brother, to hosting the Big Brother after show…) as an Elizabethan miniature, which he has called the Earl of Essex. A brilliant double reference, because that’s exactly where Rylan is from. The fourteen portraits are now being exhibited at the National Portrait Gallery. Grayson Perry is one of those people who brilliantly puts into words what you’ve been trying to think about things, but haven’t quite been able to form into fully cogent thoughts. 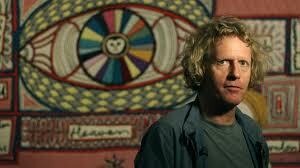 Follow him on Twitter @alan_measles, which is the name of his teddy. Of course it is. I also follow his lovely wife @philippa_perry and his daughter Florence, @FloPerry, so you get the whole fabulosa family including the teddy. The great joy is I have another episode recorded and read to watch, so that’s tomorrow night sorted. I don’t know if readers outside the UK will be able to watch the shows, but here’s a link to the Channel 4 website. ooh, I must agree about G Perry. 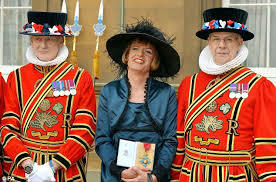 He’s a fascinating cultural vivisector in a fascinator. Thanks for this – which kind did you have? The severe flushing or the surface of Mars? I’m the latter!